Michelle and Cory tied the knot on a gorgeous Sunday evening aboard one of the historic Hornblower Yachts. 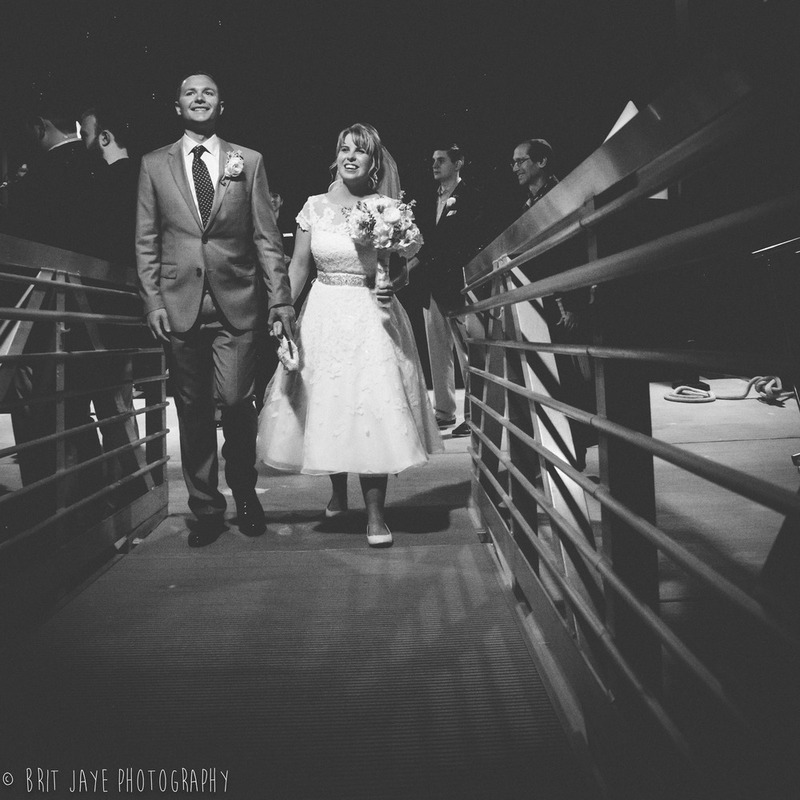 Their vintage nautical inspired wedding was so lovely and completely romantic. We began the day with Michelle and her girls as they prepared for the big day. Hair was done by Kristi Jones of Big Day Hair & Makeup. She did an amazing job on all of the girls! All of the girls even had enough time left when Kristi was done to hit the chair again for touch ups before photos! I love the sea star barrettes Michelle chose to accent this gorgeous bridal up-do! Makeup for the big day was done by Melissa from Ultra Lux salon. She did an amazing job and also provided touch ups for anyone that needed it before it was time to leave. She had a full kit at the ready and was able to accommodate Michelle's request for airbrush makeup. All the girls looked absolutely flawless when Kristi and Melissa were finished dolling them up! Michelle's girls wore a gorgeous shade of nautical blue. These darling tea length bridesmaid dresses were perfect for the occasion. Michelle gave all of her bridesmaids matching necklaces to wear. These darling sea star pearl necklaces were a perfect bridesmaid gift. All the girls loved it! Michelle chose to have two pairs of shoes for her big day- a brilliant idea! She had her open toed pumps to begin the day, and a pair of more comfortable flats for dancing. Both pairs of bridal shoes are absolutely adorable. I love that Michelle carried this beaded lace clutch; and her chandelier earrings were the perfect bridal accessory. Her unique engagement ring required a custom made wedding band. The two rings fit perfectly together like puzzle pieces. Everyone was so excited in the moments before the wedding. The girls helped secure Michelle's veil. As all the details began to come together; for the first time, Michelle felt like a bride. Michelle chose a lovely Tea length dress with a vintage inspired design and a lace illusion neckline. She added a belt with rhinestone detailing. We were able to take a few moments for photographs before the limo arrived to pick everyone up. Michelle and her bridesmaids had these darling parasols to keep away the southern California sun. The Bride had a gorgeous lace parasol and the bridesmaid had pretty pink. The limo arrived and we all headed towards downtown San Diego and the Hornblower Yachts. We were the first to arrive at the docks. The boys were still busy getting ready at a nearby hotel. The Hornblower Yachts are absolutely gorgeous. The Renown was the perfect size yacht for a more intimate wedding. The staff aboard The Renown were truly incredible. Michelle gave them all of her decor and they set the tables up perfectly. Her vintage nautical wedding theme was executed with perfection. All the gorgeous floral arrangements were done by Kenner & Sons. They did a phenomenal job; not only were the flowers absolutely flawless, they really had the perfect vintage nautical look. I love the blue mason jars paired with white flowers and subtle green accents. The bridal party headed to a suite below deck to hide out before the ceremony. The bride and her girls watched as the groom arrived through a tiny window low on the boat, where he couldn't see her. The groom and his groomsmen arrived to the docks with all of the wedding guests. Michelle and Cory had lots of family and friends travel to see them tie the knot. The quality of service on the Hornblower Yachts is incredible. They were always a step ahead of what was going on and they kept everything moving on schedule throughout the evening. As guests arrived, they were greeted with a glass of champagne to enjoy before the ceremony. Cory's mom was kind enough to help all the groomsmen and the groom with their boutineers. As Michelle walked down the aisle to her groom, she looked absolutely radiant. Michelle and Cory said their I do's as the sun set over the San Diego Bay. The Captain performed a beautiful ceremony on the water. It was completely obvious how perfect these two are for each other. They were so happy to be married. Michelle loves ducks, so they decided on a unique cake topper- bride and groom rubber duckies! So cute , and so appropriate for a wedding on the water. Their gorgeous cake was made by Twiggs Bakery. The Hornblower Yachts also brought out a gorgeous tray of chocolate and strawberries. The DJ aboard the yacht was awesome. She had every song at her fingertips and was ready to play any request. The couple had their first dance together as husband and wife, surrounded by their family and friends. The sparkling San Diego skyline was the perfect romantic backdrop. These two are so happy and in love. There were so many beautiful moments on their big day, and they will definitely have a lifetime of many more. Congratulations Cory and Michelle! Wishing you the happiest ever after. Thank you so much for choosing us to capture your special moments. If you are getting ready to tie the knot and are in search of a photographer- contact me!